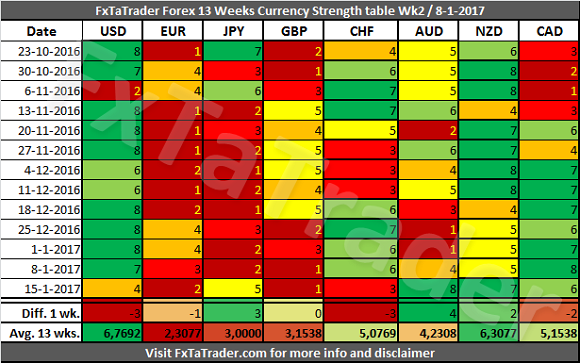 In the Currency Strength table the AUD was the strongest currency while the GBP was the weakest for the second week. The AUD gained 4 points last week and the JPY gained 3. The USD and CHF lost 3 points. 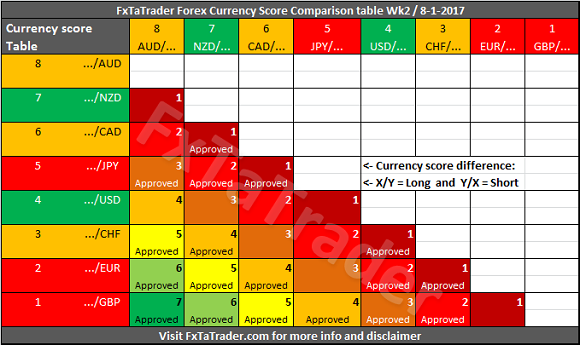 All the other Currencies remained around the level of the previous week with a maximum difference of just 2 points. A new page named Statistics and Probabilities has been added to my blog. Most important motive is to emphasize that "Statistics and Probabilities" are used in my Technical Analyses. It makes it clearer that the overviews provided in my articles are not based on certainties about the future because this is simply impossible. A professional Trader is aware of this but for who may believe that e.g. the "Currency Comparison Table" provided here below is a sure bet, by just trading the pairs with the highest Currency Score Difference, I recommend reading the new page "Statistics and Probabilities". When looking at the Average 13 wks. Score the USD remains the strongest of all while the EUR remains the weakest. The currencies are nested around a certain level which makes clear to what classification they fit best. The only currency where this can be doubted is the AUD with an Average 13 wks. Score of 4,2308. That is a score between the Neutral and Weak currencies. The USD and the NZD are frequently switching places and the NZD is this week stronger again. 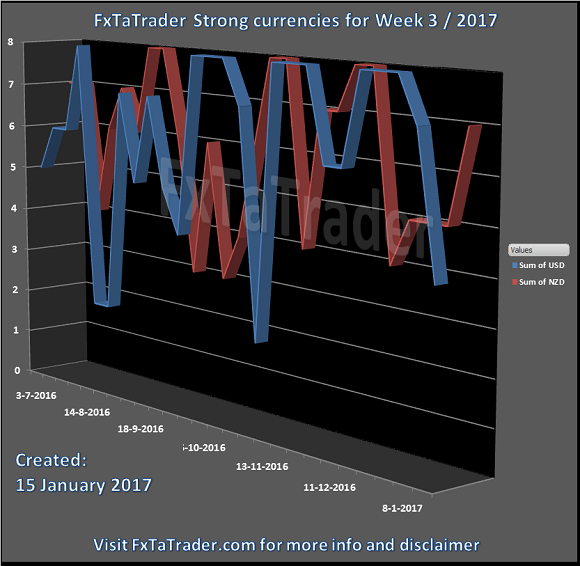 Both currencies are very strong for a long time.Below you can see the Weekly Currency Score Chart with the 6 months data as a reference. Some of the pairs in the "Currency Comparison Table" comply for a longer term trade based on the Technical Analysis (TA) of the Daily and Weekly chart. For the coming week these seem to be: GBP/AUD, GBP/NZD, GBP/CAD, EUR/AUD, EUR/NZD, GBP/USD, EUR/CAD and CAD/CHF.